Dolly Darlings - Hat box Series 1965 - The Hasbro Dolly Darlings 1965 dolls all have molded hair are 4 1/2" tall and were the first dolls in this series. They were packaged in a plastic hatbox case with a clear front cover. 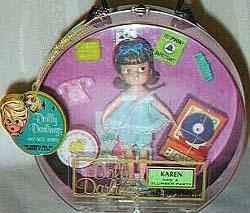 Each came with an assortment of tiny accessories that complimented the dolls character. These dolls have painted facial features and the distinctive "ballerina" like hands. Clothing can be removed, but is very difficult to get back on, due to the wide arms that rotate, but do not bend. 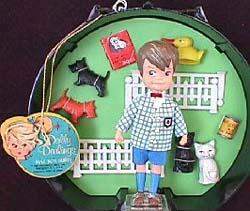 John and his pets has the dubious distinction of being the only male doll created in the Dolly Darling series and was not recreated in any of the subsequent rooted hair dolls, as the rest of these dolls were, but with new names. © 1965 Hasbro Hong Kong or Japan. John is 4 1/2" tall with brown molded hair, brown painted eyes, closed mouth, wore a blue and white checked jacket with a pocket crest, white shirt with red bowtie, solid blue shorts with blue painted socks and brown painted shoes, his accessories are: two dogs; red and black, red cardboard book "How to teach Cats? ", two cats; white, black, can of cat food, yellow duck, four pieces of white plastic fencing. 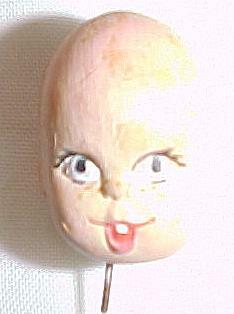 This is a early prototype head. 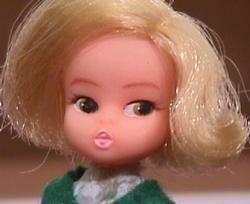 Notice that her facial features are the same as the head to the left, except she has side glancing eyes. Also, her hands are reversed from the production dolls and she is shorter. 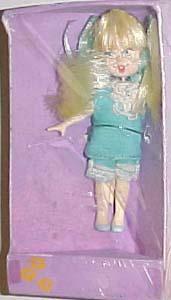 Her outfit is the same as Fancy Pants (8543) pictured below, the actual packaging was changed too. Bottom row, left to right: 8510 Teatime, 8511 Go Team Go, 8512 Slumber party, 8524 Technicolor.